The Old Talbott Tavern is the oldest stagecoach stop in the USA and until now it is serving people travelling through Kentucky with impeccable service. Come to The Old Talbott Bed & Breakfast and you might just see the ghost of the outlaw Jesse James. The Old Talbott has a long history. It has provided food and shelter to famous people, including Abraham Lincoln. However, the inn’s most famous ghost is the outlaw Jesse James. It is believed that until now, he still visits the inn. If you visit the hotel, you can still see the painting riddled with bullet holes which Jesse James put there himself. There are also reports of a mysterious woman who continues her haunting of the hotel. Other reports include items moving on their own, things disappearing and re-appearing in other parts of the hotel. Furniture has been seen to jump up and down unexplainably. Shadows moving quickly and vanishing just as fast have been reported throughout the tavern. Doors apparently open and close of their own accord, and lots of footsteps and strange sounds are heard throughout the day and night. The passage of time is evident from a few creaking floorboards in The Old Talbott Tavern. The place has an air of times gone by and people long gone. In the old days, travellers used to arrive in the inn on horseback, now they arrive in cars. Tourists, as well as locals, mingled with each other. The hotel has never closed since it opened in 1770. 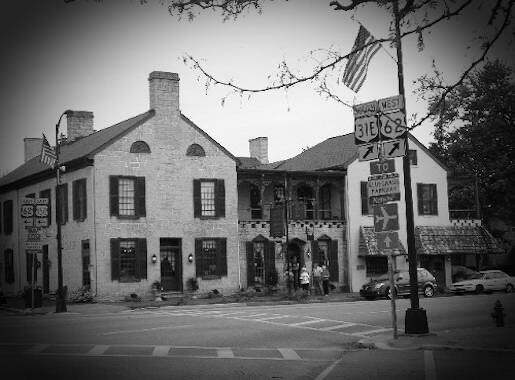 Throughout history, The Old Talbott Tavern has been the place of rest for various historical figures such as Daniel Boone, Abraham Lincoln, Gen. George Rogers Clark and French King Louis Philippe. On March 1998, the Tavern suffered from a devastating fire. The roof and most of the second floor was badly damaged. Some of the murals were damaged and have still to be restored. Extensive rebuilding was done and the Old Talbott reopened in 1999. The Old Talbott Bed & Breakfast has five rooms available for accommodations and they are all decorated with antiques. Each of the five rooms is named after someone famous. The Tavern is available for people who would like to book for parties of large groups and weddings. The Bourbon Bar offers guests light snack, drinks and live entertainment on weekends. Happy Hour is from 5 to 7 in the evening from Mondays to Fridays. Before leaving the tavern, guests can purchase souvenirs from the hotel’s gift shop. There are interesting items to take home with you. Kentucky is famous for its bourbon and Maker Mark’s Distillery offers visitors a tour of their facility and explains to people how bourbon is made. If you want to know more about Whiskey, you can go to The Oscar Getz Museum of Whiskey History. The museum has rare whiskey artefacts dating back to post-Prohibition days. A definite stop for bourbon lovers complete with novelty whiskey containers and rare antique bottles. The St. Joseph Proto Cathedral is listed as a national landmark by the U.S. Library of Congress. It is open all year round. Federal Hill is also located nearby and it was the inspiration for the song “My Old Kentucky Home” by Stephen Foster. The mansion is still open until today and it offers tours to visitors. If you get hungry from visiting all these great places, you can go to The Old Stable Restaurant. The restaurant serves evening buffets which will delight your palate.